This page is for the original game. 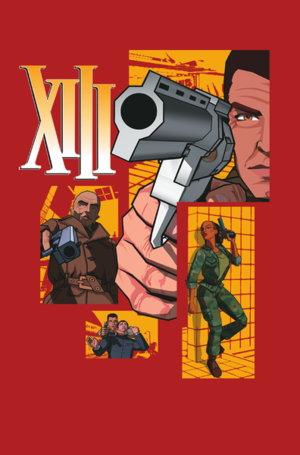 For the remake, see XIII (2019). Official master server for online multiplayer shut down in 2012 — alternative master server is available. Released on multiple CDs, later editions on 1 DVD. Patch 1.3 removes the copy protection. All patches include previous patch updates (except for patch 1.5). Create two copies of this file in the same location. Default is 85° horizontal. See Field of view (FOV). Open the XIII.ini file with Notepad or other text editor. Change the values of FullscreenViewportX=800 and FullscreenViewportY=600 to your desired resolution. Requires starting a new profile. Open the DefUser.ini file with Notepad or other text editor. 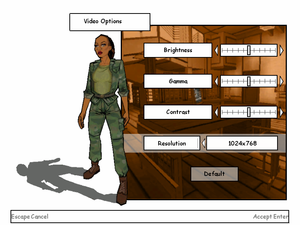 Change the values of DesiredFOV=85.000000 and DefaultFOV=85.000000 to your desired FOV. Click on Input tab, set Cursor clipper to Locked. Enabled by default, poorly implemented, causes issues with frame rate pacing, stuttering, as well as with severe input lag. Enable in control panel for best results. Mouse is barely usable unless you use 125 Hz polling rate. Patch 1.4.2 fixes this. Change the values of MouseX=Axis aMouseX Speed=6.0, MouseY=Axis aMouseY Speed=6.0 and MouseSensitivity=3.00000 to fine-tune your sensitivity. It's not recommended to adjust MouseSensitivity as the in-game slider may override it. Choose when installing unofficial patch 1.4.2. See Issues with dedicated server. Open the console (F2) and use SWITCHLEVEL followed by the IP and port. Only for the 4-CD retail version: This is to fix the pop-up that appears on CD 2, which says: "Delete all configuration and saved games files? (Answering YES will delete the XIII installation folder and all of its content)". Answering Yes or No stops the installation and constantly reappears if you start the installation again. Copy the entire CD to each of their respective folders, e.g. CD 1 to the CD 1 folder, and so on. Open the Task Manager (Ctrl+⇧ Shift+Esc) and go to Processes. Start setup.exe in the CD 1 folder. Installation of CD 1 will continue. Follow the rest of the installation instructions. Putting XIII in compatibility mode for "Windows XP (Service Pack 2)" crashes less and helps performance while running the game. 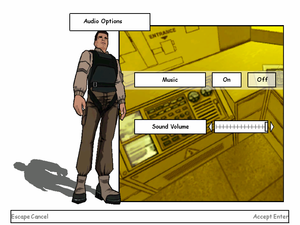 While in main menu minimize the game (Alt+Tab ↹). Open the Task Manager (Ctrl+⇧ Shift+Esc) and click on the Processes tab. Right click xiii.exe and click on Set Affinity. Make sure only CPU 0 is selected. The game now runs only on one processor and should work without any crashes. The game runs with a blurred, slow frame rate. Vsync can be re-enabled manually in the graphics adapter settings (Nvidia or AMD Catalyst Control Panel). Left mouse click causes focus change away from the fullscreen window back to your desktop. Checkpoint save only applies when you die during your current play through and does not save your game. You need to quick/manually save it. Loading any level manually can be done if needed. Set the resolution from the list (e.g. 1920x1080, 119Hz). Uncheck Disable Alt-Enter to toggle screen state and dgVoodoo Watermark and click OK.
Patch 1.3 causes many problems with the dedicated server launcher. When hosting a dedicated server, it tries to connect to an inactive master server. Go to the configuration file(s) location; <path-to-game>\Server\ when using unofficial patch 1.4. Delete the ServerActors=IpDrv.RegisterServerToUbiCom line or insert a semicolon (;) before it. ↑ Ubisoft Support - Multiplayer wurde eingestellt! ↑ GOG.com - Forum - Are you kidding me?! ↑ Opaquit's XIII Files - XIII Downloads - from patch description: "Dedicated servers work again, just like with version 1.0"